Don’t have time for a full course meal? No problem. Enjoy a casual bite to eat in our Castle Shop Bakery, located in the lower level of Bavarian Inn Restaurant. Choose from our tasty take-out menu featuring Bavarian Inn dinners such as Frankenmuth chicken as well as German specialties. You can also order many of our yummy sides like noodle soup, mashed potatoes, buttered noodles, baked dressing and sandwiches just to name a few. Two convenient dining options: -Pull up a seat in the bakery and enjoy -Order to go – and we even have Curbside To Go where we deliver your order right to your vehicle While here don’t miss out on our wonderful baked goods made from scratch daily such as our award winning pies, specialty breads, cookies, cakes, strudel, pretzels and other tasty treats. We also have delicious coffee, hot chocolate and other beverages for you to enjoy while visiting with friends and family. 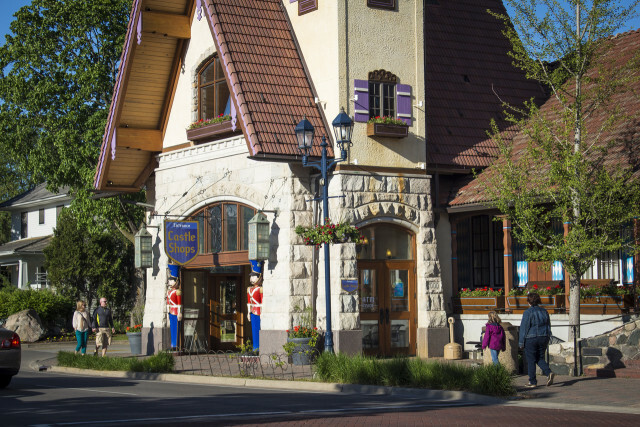 A visit to Bavarian Inn Restaurant is not complete without a stop for dinner or just a treat in our Castle Shop Bakery.